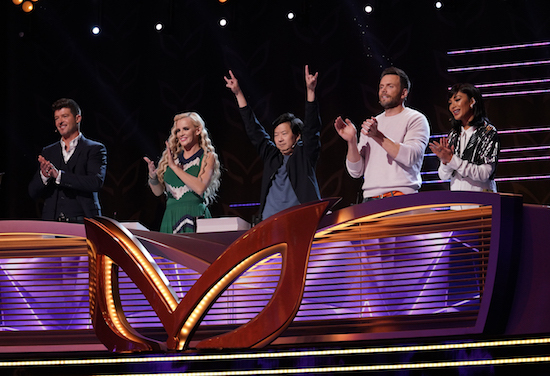 THE MASKED SINGER: THE MASKED SINGER: L-R: Panelists: Robin Thicke, Jenny McCarthy, Ken Jeong, guest panelist Joel McHale and panelist Nicole Scherzinger in the “Another Mask Bites the Dust” airing Wednesday, Jan. 23 (9:00-10:00 PM ET/PT) on FOX. © 2019 FOX Broadcasting. Cr: Michael Becker / FOX. Tags: Margaret Cho, Masked Singer, Masked singer season 1, Masked Singer spoilers, Who was the Poodle on Masked Singer, Who was unmasked on The Masked Singer?